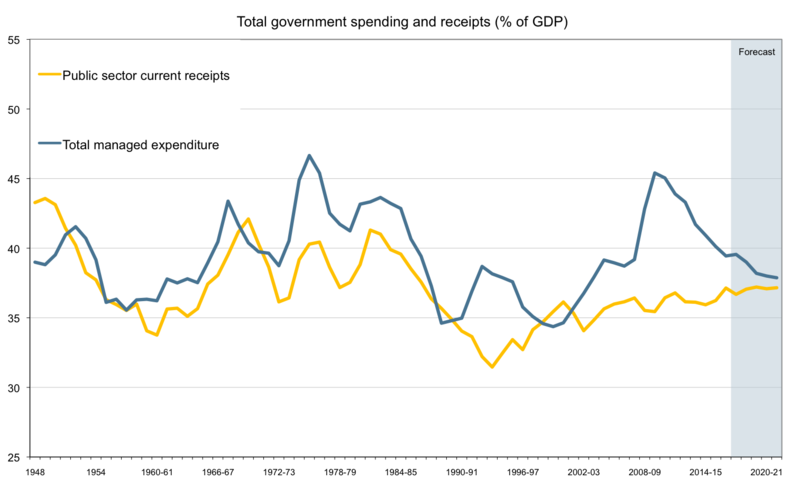 The OBR's chart for tax revenues v spending since 1948 is from here. The deficit periods (blue line above yellow line) tend to follow house price boom/busts (early 1970s, 1990 and 2008), i.e. 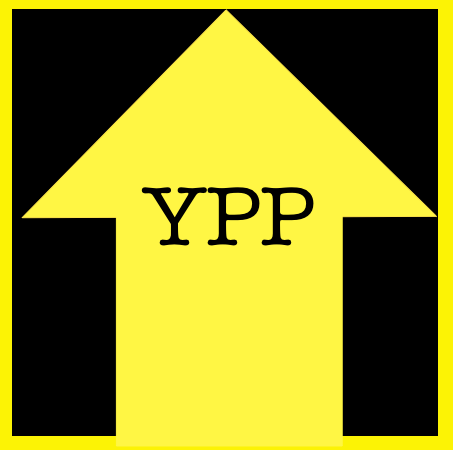 if we could keep house prices low and stable (via LVT or any other means), there would be no booms, no busts and hardly any deficit periods. 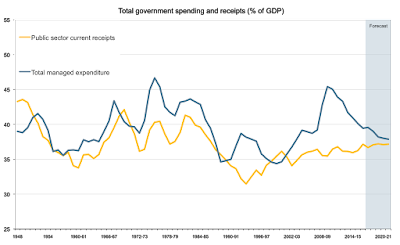 If spending had been kept at 2004-05 levels (which were hardly lean years) in real terms, then this year, the public finances would have been in a break-even position. And as a matter of basic fact and logic, a lot of so-called government taxation and spending is neither, because the people paying the tax are also recipients of spending. Pensioners receive state pensions and other pensions (out of taxes which everybody pays in) and then pay tax on their private or occupational pensions; Council Tax; tobacco and alcohol duty. To some extent, pensioners pay for their own pensions. Basic rate taxpaying parents receive Child Benefit, funded out of the taxes they paid themselves. Some lower earners receive Working Tax Credits and then a similar amount deducted from their wages in PAYE. It seems silly to count pensions, Child Benefit and Working Tax Credits as "spending" as they are merely tax rebates or "transfer payments". Some people pay in more than they get out and others get out more than they pay in. Please note: Pensioner and child benefits have been treated as spending, but to give a fair like-for-like comparison, it is easier to treat working age benefits (various kinds of unemployment benefit and half of Housing Benefit) as tax rebates. 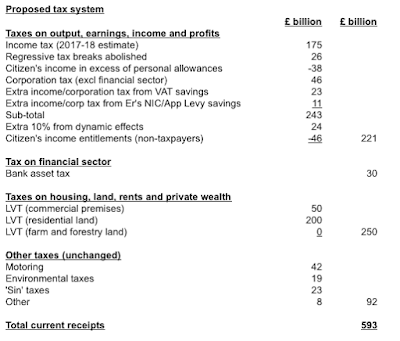 Net taxes raised on this basis are around £600 bn a year. - The abolition of VAT and National Insurance and the replacement of existing taxes on land and buildings/private wealth with LVT of approx. 3% of current selling prices. - There are just under 40 million working age adults in the UK (aged 18 to 64), who would be entitled to claim the Citizen's Income at the current Income Support/Employment Support Allowance weekly rate of £73.10. Those in work can waive this and claim a personal allowance for income tax purposes of £19,000 (which has the same cash value as the Citizen's Income). - The abolition of regressive tax breaks, such as tax breaks for pension saving, which merely maintains share prices at high levels and does not particularly stimulate real business investment. 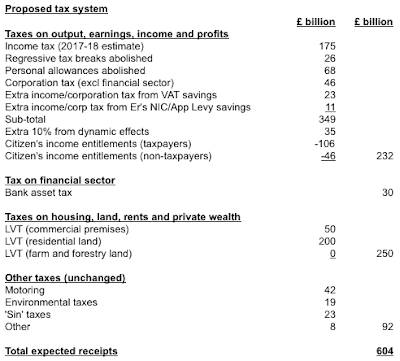 We do not believe in taxing private wealth (apart from land wealth) but we certainly don't believe in subsidising it. - Banks can earn a 2% interest margin between loan and deposit interest rates in their sleep due to their privileged position, deposit guarantees etc. So a tax of anywhere up to 2% would have no negative impact on actual bank lending/deposit taking. UK banks currently boast that their balance sheets are £6,000 billion (the true net figure is probably more like £1,500 billion), so to get things started, we would increase the bank asset tax from 0.075% to 0.5%. Banks will then shrink their balance sheets; the rate will be increased etc. In any event, this £30 billion is only half the amount which banks claim they pay every year. - We have had to make some assumptions as to the dynamic effects of the tax changes and used figures at the bottom end of the range. 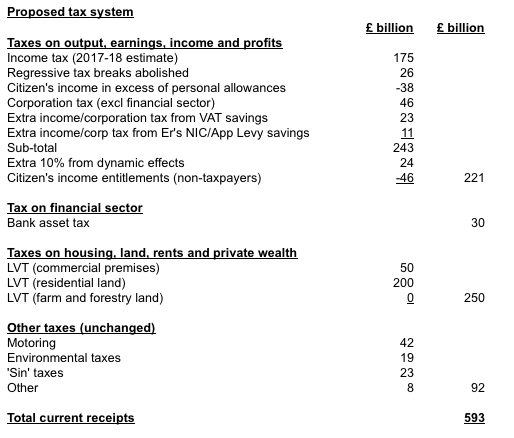 Once these are taken into account, total revenues would be much the same as under the current tax system (£600 bn a year).